The Astrophysics & Space Research Group at Birmingham has a wide range of regular outreach programmes and public engagement activities aimed at school students, science teachers and the general public, some of which are detailed below. The group's activities are coordinated by an enthusiastic team, if you have any questions, please contact us via email (astronomy[at]star.sr.bham.ac.uk) or Twitter (@UoBObservatory). We also actively participate in the outreach programme of the School of Physics and Astronomy, which is coordinated by Maria Pavlidou. Astronomy in the City is back for a new season of astronomy talks, observing, tea and biscuits and your chance to ask us all your astronomical questions! Future events this season will be on 23 January 2019 and 6 March 2019. PhD Student Aaron Jones spoke on this months Physics World Podcast about his work using Gravitational Wave technology to develop art with local artists. Birmingham researchers were at this year's Gravity Fields festival presenting 4 days of interactive workshops, talks and science-based performance. Contact Aaron W Jones for more information! At the Royal Society Summer Science Exhibition in July 2017 we presented our exhibition "Listening to Einstein's Universe" alongside several other universities. 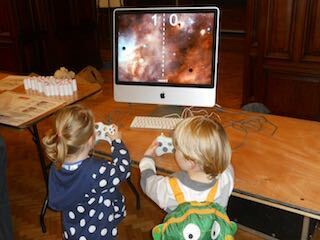 The exhibition showcased gravitational-wave science with interactive and hands-on demonstrations for all ages. 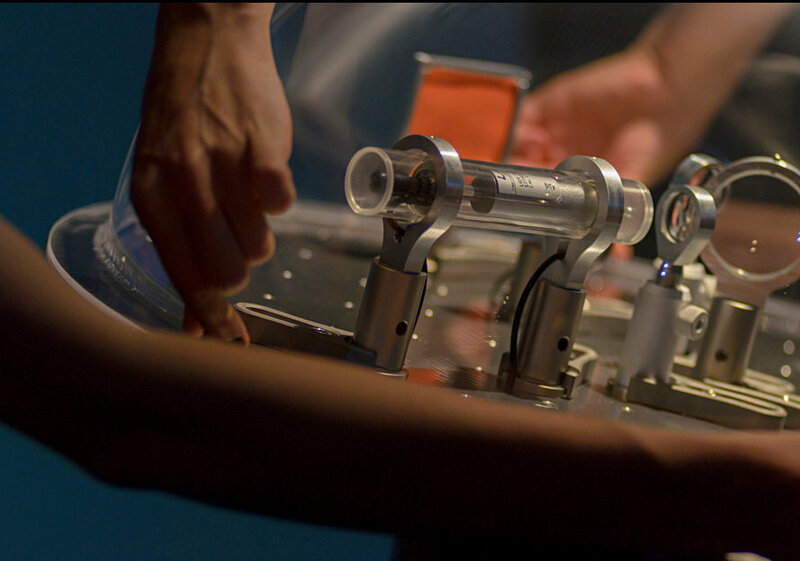 In the summer of 2016, we opened a brand new exhibit at the Thinktank Birmingham Science Museum, celebrating the detection of gravitational waves. 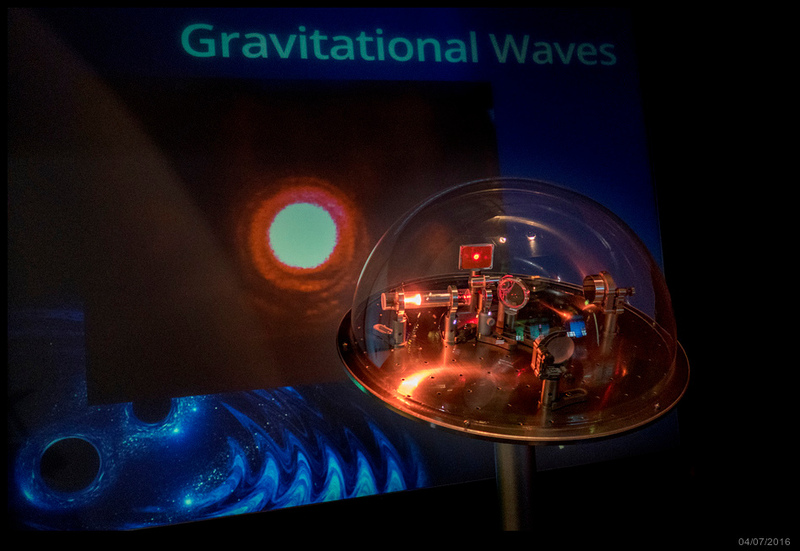 Visitors can interact with a model version of the large gravitational wave detectors, using laser light to reveal tiny vibrations and also learn more about black holes and gravitational waves, through material prepared by students from our group. Find out more. Astronomy in the City runs throughout the winter, and so the current season has ended. To keep up to date with upcoming events please join our mailing list mailing list or follow us on Twitter and facebook. On 11 June 2016, Alberto Vecchio and Andreas Freise gave a talk at TEDxBrum on their work within the LIGO Scientific Collaboration and on researching gravitational waves. You can watch a recording of their talk on YouTube. On 17 February 2016, the Astrophysics and Space Research Group held a special event to celebrate the discovery of gravitational waves 100 years after Albert Einstein's prediction and the beginning of a new era of astronomy. As part of the global LIGO Scientific Collaboration, scientists from the University of Birmingham have confirmed a major prediction of Einstein's theory of general relativity through the detection of gravitational waves! Find out more about Gravitational Wave Astronomy at the University of Birmingham. We often use games in our outreach activities. 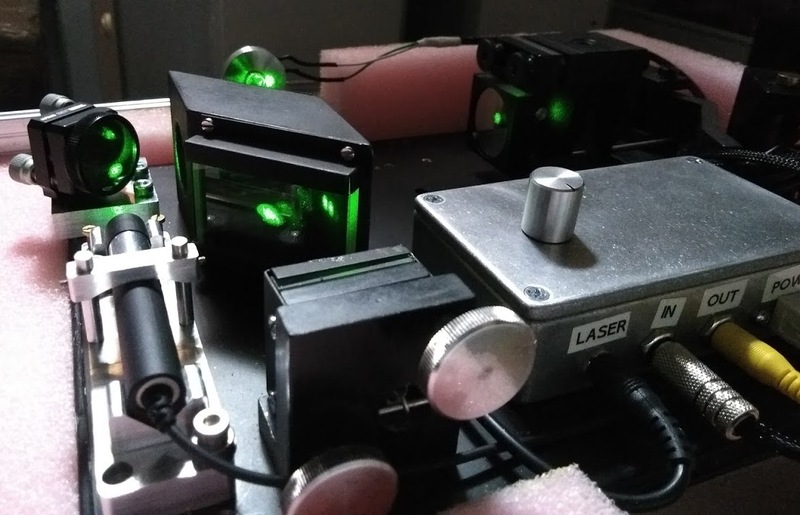 Memebers of the group have now founded the spin-off company Laser Labs to update our apps and to bring them to popular mobile app stores (iOS and Android). 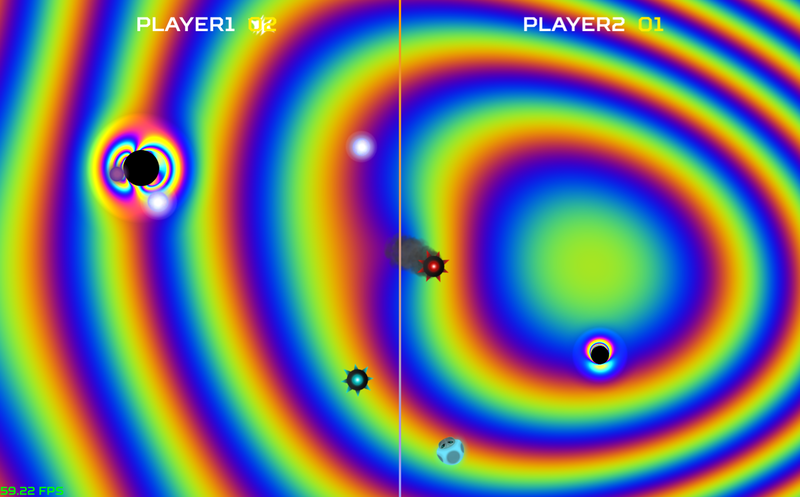 Our first two apps are now available: try Pocket Black Hole to play with the light bending properties of a black hole and download Stretch and Squash to find our how gravitational waves affect things. The group frequently run workshops and events which can be adapted for a wide range of audiences. We host masterclasses for school visits, ranging from key stage 3 to key stage 5; we visit science festivals and fairs, and we are a staple at open days. 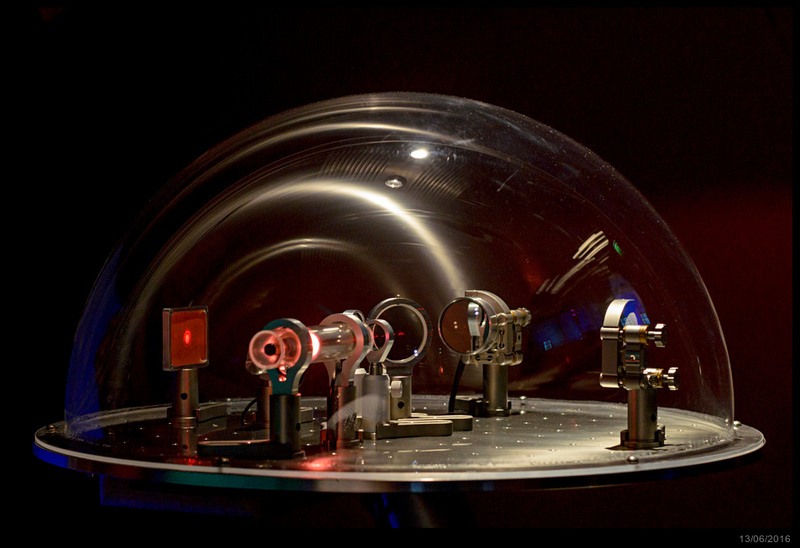 Many of our demonstrations, like the ever-popular Lycra Universe, have their origins in our exhibition Looking for Black Holes with Lasers. Some of our recent activities are listed below. The group have recently acquired a planetarium, and we are working on developing a range of shows to make use of it. We will be bringing it to events, school and science fairs to give tours of the night sky and the systems we study. We have a wide range of online resources and downloadable material for those who want to learn (or teach) about astrophysics, or just want to have fun. These range from an eBook on graviational waves and a micro-site on X-ray astronomy (in particular the XMM-Newton satellite), to free games such as Space-Time Quest where you can build your own graviational-wave detector and Black Hole Master, the classic game Pong with a twist! A full range gravitational-wave resources can be found via gwoptics. Throughout the year we run a series of special public events. Each Astronomy in the City is an evening packed with astrophysics; stargazing, and tea and biscuits. Learn about astrophysics and astronomy with talks on this month's night sky and current research; a question and answer session with our friendly expert panel, and the chance to observe (weather permitting) with the University of Birmingham Astronomical Society's portable telescopes and the University's historic Grubb telescope. A lucky few will have the opportunity to visit the University's Observatory and see its half-metre telescope. Of course, there'll be our usual hands-on activities too. These events are supported by a community partnership between us, the Astronomy Society, Birmingham Astronomical Society, Knowle Astronomical Society and Solihull School. Astrophysics workshops & masterclasses: We regularly organise activities for school students, using the resources of the Astrolab and our hands-on demonstrations. Most recently, we have hosted year 9–11 students for a workshop to coincide with BritGrav 15; year 10 and 11 students for Physics Experience Week; year 10 students for Discovery Day, and year 9 students for Girls in STEM Day. These are primarily organised through the Schools Liason Officer. Work placement for school students: We accept school students for work experience programmes lasting one or two weeks during vacations, to provide them with an early taste of research. This activity is coordinated by the Schools Liaison office. Science fairs and school visits: We venture outside of the University to attend a variety of festivals and other events. Some highlights include the Royal Society Summer Science Exhibition (2017) alongside other universities with our exhibition "Listening to Einstein's Universe", the Teen Take-over at Thinktank; the Think Corner pop-up shop; the Cheltenham Science Festival (2013 & 2017); the Malvern Festival of Innovation (2017), the Gravity Fields Festival (2012, 2016); the Big Bang Fair (2014, 2015) and Little Big Bang Fairs (2015 & 2017); the WINGS 2014 international scouts and guides jamboree, and the Pint of Science Festival 2015, 2016 and 2017 (for which Aaron Jones organised talks on particle physics, stars and gravitational waves) in Birmingham. We have helped out regularly at the British Science Festival, with demonstrations, classes and talks; in 2010 (where we debuted our exhibition Looking for Black Holes with Lasers) and 2014 this was at the University of Birminigham, so it was especially convenient. We also visit local schools. 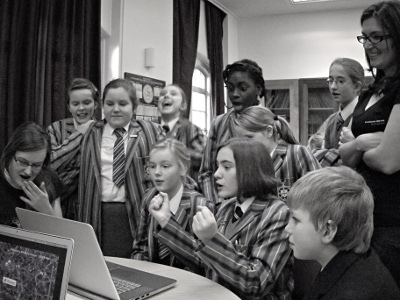 Simon Stevenson has given a lunchtime talk at King Edward VI Camp Hill School, Christopher Berry gave a talk at King Edward VI Five Ways to coincide with the opening of their observatory, and Maggie Lieu has given a Skype call to Selsdon Primary School & Nursery, London on exploring Mars! Michaela Nelson, with support from the Royal Society, ran a project on electromagnetism at Perrifeilds Primary School constructing a small wind turbine. We gave a talk and workshop for school physics teachers at the IOP Physics Big Day Out at Cosford. A group of our PhD students gave talks and showed demonstrations at William Brookes School as part of their series of Cafe Scientifique evening events. Combining arts, history and science: Trevor Ponman helped to create an emersive retelling of the history of the Universe featuring poetry, music and a planetarium: e-x-p-a-n-d-i-n-g: The history of the Universe in 45 minutes featured in the Arts & Science Festival, the Wenlock Poetry Festival, the Stratford-upon-Avon Literary Festival and the Birmingham Literature Festival. 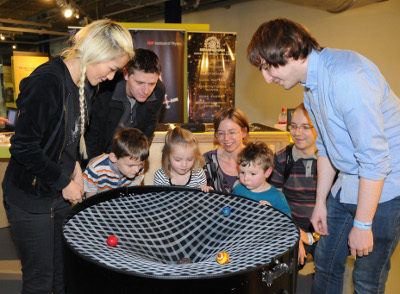 We have also exhibited at the Birmingham Fun Palace, which celebrates both arts and sciences. 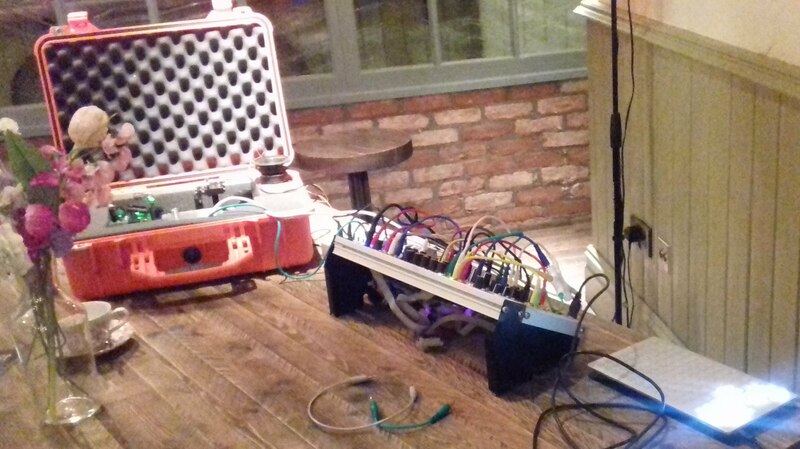 We have collaborated with audio-visual artist Leon Trimble, experimenting with the live translation of gravitational-wave instruments into sound, at Pint of Science (2017) and The Superpostion ASMbly Lab. 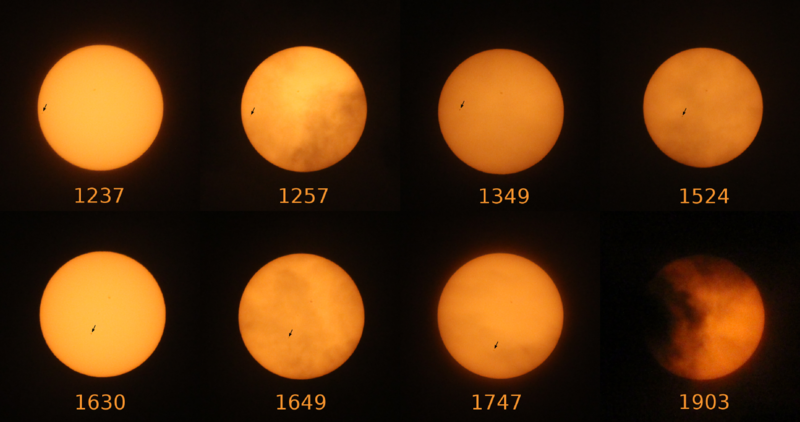 We joined Birmingham Cathedral's 300th anniversary celebrations to view the partial solar eclipse on 20th March 2015. Collaboration with ThinkTank: Members of our group have played important roles in planning and running events and exhibitions for ThinkTank, Birmingham's popular museum of science, including our recent exhibit about the detection of gravitational waves installed in the Futures Gallery (see pictures above). We have also participated in several of their Meet the Experts events. Talks at other venues: Group members regularly deliver popular talks at schools, astronomical societies and other events. Audiences have included the Ogden Trust Physicists of the Year, Birmingham Astronomical Society, Knowle Astronomical Society, Lichfield Science & Engineering Society, and the Federation of Astronomical Societies Convention. Andreas Freise gave a talk at the Royal Institution as part of the IOP's 2013 Physics in Perspective, and Ilya Mandel gave a talk at the Aspen Centre for Physics which you can watch or listen to. Talks by guest speakers: The Patrick Moore lecture series organised with the Astronomical Society is a tea, talk and telescope evening with observing when weather permits. Past speakers have included Lucy Hawking, John Brown and Brian Cox. To coincide with BritGrav 15, Prof. Jim Hough gave a guest talk on the science of gravitational-wave detection and what to look forward to in 2015. Institute of Advanced Studies Distinguished Visiting Fellow Cole Miller gave a lecture on the mysteries of black holes in 2017. Online communication and popular writing: The Gravitational Wave Group post short summaries of recent papers for those interested in their research. You can also keep up-to-date with gravitational-wave news from LIGO through the LIGO Magazine, which group members edit and contribute articles too. Jim Barrett and Hannah Middleton took part answering questions in I'm a Scientist get me out of here. Some group members write about science and astronomy in their personal blogs, including Maggie Lieu and Christopher Berry; Andreas Freise shares research-related pictures from his Instagram, and several group members share science stories on Twitter, you can also follow the Obervatory or Institute of Gravitational Wave Astronomy. Media coverage: Occassionally stories about our research or outreach activities are covered by the popular press. 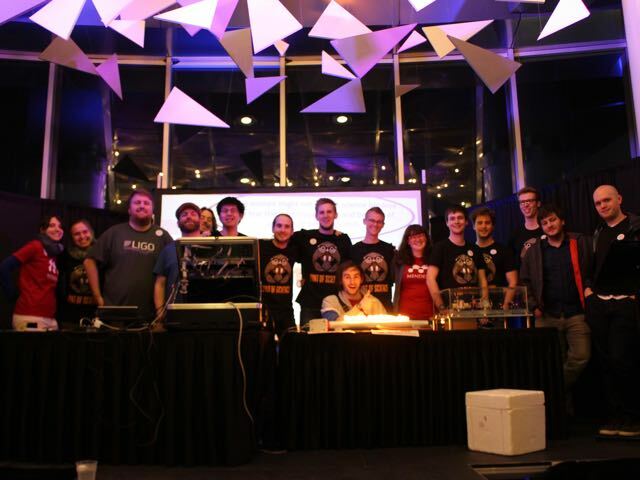 BBC News reported on the progress of Advanced LIGO following the British Science Festival 2014. BBC Midlands Today has reported on our Stargazing Live activities in 2012 and 2013. Somak Raychaudhury has actively participated in various science programmes on BBC Radio 4, including Stars in their Eyes.